All eyes are on the one senator who remains undecided on Brett Kavanaugh's Supreme Court nomination. The number of undecideds shrunk to one after Sens. Joe Manchin, D-W.V., and Susan Collins, R-Maine, just declared that they will be backing Kavanaugh hours after Sen. Jeff Flake, R-Ariz., made a similar comment to reporters. That leaves Sen. Lisa Murkowski, R-Alaska, who hasn't publicly said whether she will support Kavanaugh, whose appointment has been clouded by controversy because of sexual misconduct allegations. Murkowski hinted Thursday that she might be leaning toward voting against him, telling reporters Friday that "he’s not the right man for the court at this time." Republicans currently hold a one-person edge in the Senate, with 51 of the Senate's 100 seats; Democrats hold 47 seats and there are two independents who typically caucus with the Democrats. Here is what we know about where the four key votes stand. Sen. Susan Collins arrives to view the FBI report on sexual misconduct allegations against Supreme Court nominee Brett Kavanaugh, on Capitol Hill, in Washington, Oct. 4, 2018. She gave a roughly 40-minute speech on the Senate floor Friday justifying her decision to vote to support Kavanaugh's nomination in spite of the accusations of sexual assault and misconduct that he has faced. Collins called the testimony of Christine Blasey Ford, who accused Kavanaugh of sexually assaulting her back in high school, "sincere, painful and compelling." "I believe that she is a survivor of a sexual assault and that this trauma has upended her life. Nevertheless, the four witnesses she named could not corroborate any of the events of that evening gathering where she says the assault occurred," she said. 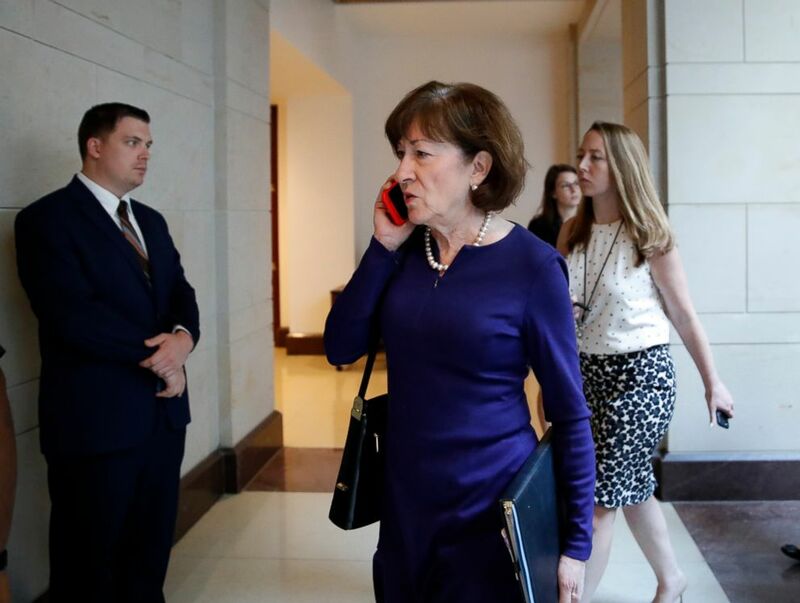 Collins is often seen as a possible swing vote on controversial decisions, and she exerted that power during the Republican-backed, so-called "skinny repeal" of Obamacare. She, along with fellow Republican Sen. Murkowski and then-Sen. John McCain, tipped the balance against the bill prompting its failure in July 2017. That said, according to 538, she does vote in line with the Trump administration 79.2 percent of the time. Collins hinted at her support of Kavanaugh when she made a comment Thursday about the FBI investigation into the allegations. "It appears to be a very thorough investigation," she told reporters Thursday. Sen. Jeff Flake walks with his wife, Cheryl, on Capitol Hill in Washington, Oct. 3, 2018. He said Friday that he plans to vote in favor of Kavanaugh, adding that "this is a tough decision for everybody." There were earlier indicators that he was leaning that way. 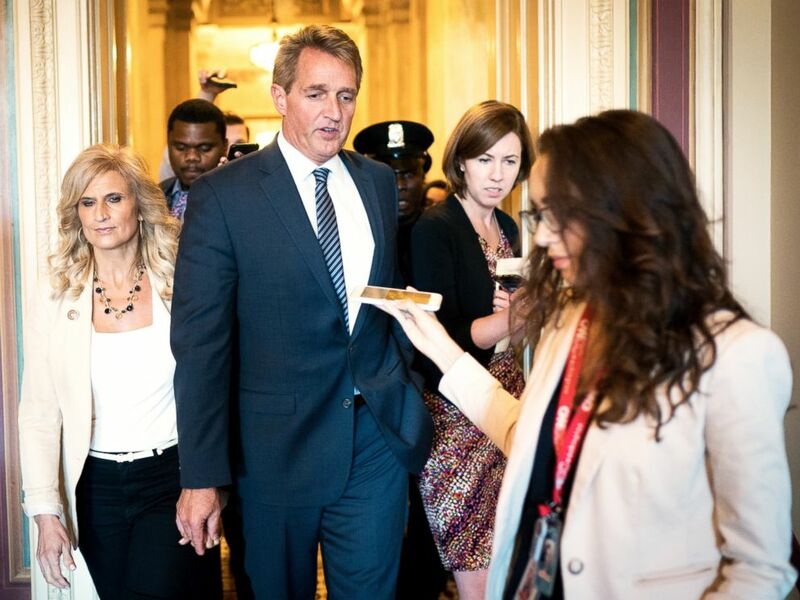 As a member of the Senate Judiciary Committee, Flake has already been the focus of a fair amount of speculation about the Kavanaugh vote. He was seen as the swing vote in the committee, and after a tense face-off with a protester, he was integral in calling for a week-long delay and an FBI investigation before the full Senate vote. He voted in favor of Kavanaugh's nomination in committee, however, and when asked about Collins' description of the FBI investigation's report, he said Thursday she was "accurate" in calling it "thorough." When asked Thursday if it was fair to say that he was leaning towards a "yes" vote, Flake said: "You can’t say anything, but you can say that I was a 'yes' before this. But I wanted this pause. We’ve had this pause ... and now we’re in the process of reviewing it. But thus far, we’ve seen no new, credible corroboration -- no new corroboration at all." U.S. Senator Joe Manchin speaks with reporters in the Senate Hart building as a rally against Supreme Court nominee Brett Kavanaugh takes place on Capitol Hill in Washington, D.C., Oct. 4, 2018. Manchin announced Friday that he will support Kavanaugh's confirmation. "I have reservations about this vote given the serious accusations against Judge Kavanaugh and the temperament he displayed in the hearing," he said in a statement. "And my heart goes out to anyone who has experienced any type of sexual assault in their life. However, based on all of the information I have available to me, including the recently completed FBI report, I have found Judge Kavanaugh to be a qualified jurist who will follow the Constitution and determine cases based on the legal findings before him. I do hope that Judge Kavanaugh will not allow the partisan nature this process took to follow him onto the court." 538 reports that Manchin has a history of voting with the Trump administration 61 percent of the time. 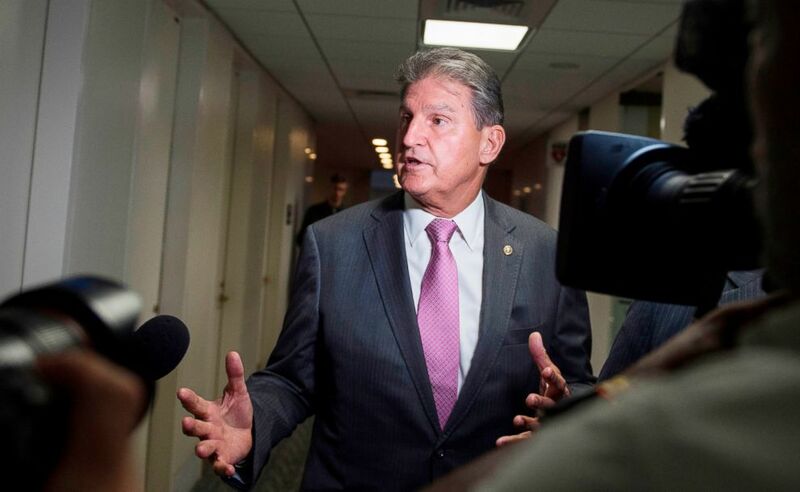 Manchin, a Democrat up for re-election in a state that has voted for the Republican presidential candidate since 2000, told reporters Thursday that his time to review the FBI documents ran out. He went back to review them Friday morning before going to vote in favor of the cloture motion, putting an end to the period of debate. Republican Senator from Alaska Lisa Murkowski is surrounded by the media before viewing documents in the Senate Sensitive Compartmented Information Facility (SCIF) in the U.S. Capitol in Washington, D.C., Oct. 04, 2018. Her history of breaking ranks with her party on critical votes like the skinny Obamacare repeal vote paints her as something of a swing vote, even though 538 reports that she has voted with the Trump administration 82.9 percent of the time. Though she has not officially said if she will support Kavanaugh, she voted against the cloture motion on Friday morning. "I believe Brett Kavanaugh is a good man. I believe he is a good man. It just may be that in my view, he’s not the right man for the court at this time," she said Friday. On Thursday, she met with a group of protesters who traveled to Washington from Alaska and they said that she gave them some opaque insights. Kate Demarest is an Anchorage-based lawyer who flew with her young children overnight to Minnesota, dropped them off with her parents and then she continued traveling to Washington, D.C., to meet with Murkowski. 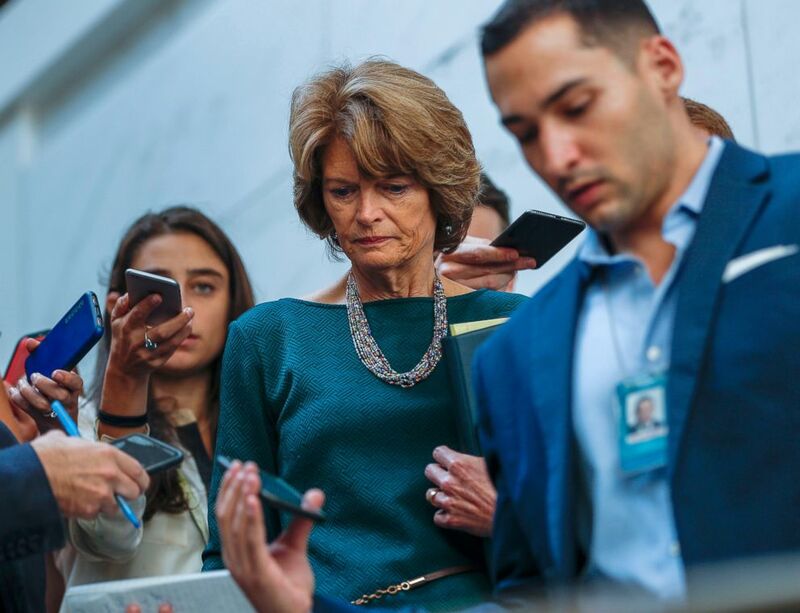 "She said directly, 'I can look all of you in the eye and say I don’t know what I’m going to do,'" Demarest told ABC News of her conversation with Murkowski Thursday.